Special equipment item which is similar to components fitted by the MG Works Racing Department to help prevent the front road springs deforming during heavy braking and affecting handling. Laser cut quarter plate steel, all drilled and ready to bolt onto the chassis and are sufficiently set out from the chassis so as not to foul the chassis side rails during hard cornering. For all cars however, it may be necessary to incorporate a minor panel modification to the side valance at the point where it passes over the lower wing stay. Alternatively, a spacer piece can be sandwiched between the chassis and the bracket to provide a little more clearance. 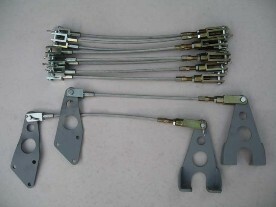 * This torsion bracket set can be fitted to P and L types as well as T types with cycle wings although if the main front wingstays being used are not the standard F/J type style then the front bracket will need to be heated and bent marginally outwards to avoid contact with the base of the later type wingstays. The front brackets are supplied in the straight upright position only. Cables are manufactured by a third party to a Vintage MG Parts specification and can be supplied at cost price.